The last few weeks before the holidays always seem to fly by, especially when many of us still have a seemingly endless to-do list to finalize that may include, among other things, holiday shopping, wrapping, decorating, planning, baking, traveling, celebrating and entertaining. With all that we would like to accomplish, time spent on maintaining our health may fall by the wayside. You skimp on sleep, eat unhealthy food on the run and forgo exercise. Before you know it, you’ve come down with a cold or other illness, adding additional stress to your holidays and sabotaging your best laid plans. Seriously, make a list. Having a plan allows you to focus on and finalize the task at hand and can help you use your time more efficiently, thereby reducing your stress load. Feel free to respectfully decline some invitations or skip events. Running yourself ragged wears down your immune defenses. Reduce your stress load by taking a breather. Good basic preventative advice includes staying home, relaxing and getting a good night’s sleep. Yes, you do need to prioritize sleep. When you are well rested, your body has a better chance to defend itself against viruses. Research has shown that adequate sleep enhances our immune defenses and aids our overall wellbeing. Hydrate, hydrate and hydrate some more. Alcohol consumption can result in dehydration, so remember to drink water in addition to those holiday cocktails. Staying well hydrated, especially during air travel, can help to keep mucous membranes moist so they can better do their job of keeping germs and pathogens out of your system. Wash your hands frequently with good old soap and water. Cold viruses easily spread through hand-to-hand and hand-to-surface contact. Avoid touching your face and mouth when you are out and about and consider carrying a hand sanitizer with you and use it regularly. Make time for some activity, as exercise reduces stress and produces feel good endorphins, further helping you to relax and boost your mood. When you are feeling overwhelmed, slow it down a bit. Deep breathing can help to keep your emotions in check and your stress and anxiety levels down. Concentrating on your breath, even for a few minutes, helps to keep you centered, grounded and calm. Make reasonably healthy dietary choices. Of course, we are all going to indulge in some holiday treats, but save those indulgences for the really special ones. Keep some healthy snacks on hand and bring something with you when you go out to shop or run errands. Having an apple instead of running through the drive though will help to keep your defenses up and any holiday weight gain down. Engage family members as much as possible to put everyone in the holiday spirit and free up more of your own time. Be realistic about what you can actually accomplish to allow you more time to enjoy family and friends. It’s okay to decline some invitations or cut back on other obligations to give yourself time to be present, mindful and grateful. 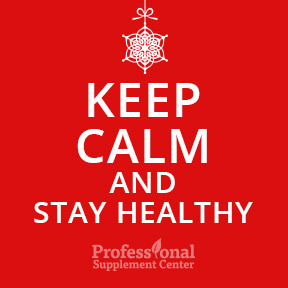 Consider taking quality probiotics to boost immune support. Beneficial bacteria positively influence immune function. Antioxidants such as selenium, zinc, beta-carotene and vitamins C and E have also been shown to aid immune health. UltraFlora® Balance by Metagenics – This top selling nutraceutical probiotic provides 15 billion CFU of live microflora per capsule in support of daily gastrointestinal and immune health. Gluten, soy and dairy free, Non-GMO vegetarian formulation. Frontier Biotics by Nutritional Frontiers – Recommended for children, adults and seniors, this non-dairy pre- and probiotic blend of 8 strains of beneficial microflora provides 5 billion CFU per capsule in support of digestive regularity and immune health. Gluten free, vegetarian formulation. Ultra Anti-Oxidant by Douglas Laboratories – This potent, wide spectrum antioxidant nutritional formula includes synergistic vitamins, minerals and active nutrients to support the body’s antioxidant defense systems. Gluten, soy and dairy free formulation. AntiOxidant Formula by Pure Encapsulations – This broad spectrum formula offers a range of antioxidant nutrients to promote cellular health and support and enhance the body’s natural defense mechanisms. Gluten and soy free, Non-GMO formulation. Buffered Vitamin C by Integrative Therapeutics – This pure, crystalline ascorbic acid, buffered with calcium and magnesium for sensitive stomachs, provides 1 gram of vitamin C per capsule. As a powerful antioxidant, vitamin C supports a healthy immune response, healthy skin, connective tissues and bone tissue. Gluten, dairy and soy free formulation. 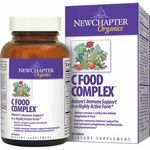 C Food Complex by New Chapter – This activated whole food complex contains a blend of vitamin C, organic herbs, superfoods and adaptogens in support of immune and cellular health. Naturally gluten free, 100% vegetarian formulation. Contains soy. E-400 Natural Vitamin E by Douglas Laboratories – This all natural vitamin E provides antioxidant nutrients in support of normal immune function and cardiovascular and cellular health. Gluten, soy and dairy free formulation. Ultimate-E® by Thorne Research – This pure, undiluted mixed tocopherol formula contains all the natural isomers of vitamin E, vital to the overall antioxidant capacity of the tissues and blood. Gluten, soy and dairy free formulation. This entry was posted in Home and tagged AntiOxidant Formula by Pure Encapsulations, Buffered Vitamin C by Integrative Therapeutics, C Food Complex by New Chapter, E-400 Natural Vitamin E by Douglas Laboratories, Frontier Biotics by Nutritional Frontiers, http://www.cdc.gov/family/holiday/, http://www.huffingtonpost.com/2012/12/15/holiday-stress-cope_n_2279208.html, http://www.ncbi.nlm.nih.gov/pmc/articles/PMC3256323/, https://www.washingtonpost.com/lifestyle/wellness/10-ways-to-beat-holiday-stress-with-fitness-and-nutrition/2015/12/14/d2de44c0-9dec-11e5-8728-1af6af208198_story.html, Less Stressful Holidays, Some Ideas for Healthier, Ultimate-E® by Thorne Research, Ultra Anti-Oxidant by Douglas Laboratories, UltraFlora Balance by Metagenics. Bookmark the permalink.